1. I traced around a glass, then drew in the center circles about the size of a quarter, with a marker. 2. I cut the "donut" forms out with sharp scissors. 3. I put the two forms together and began to wrap the yarn around the forms. This takes some time. I cut lengths of yarn from the skein...you can't wrap it directly from the skein. Just cut some yarn, wrap it, cut some more...and so on. 4. Keep scrunching the yarn close side-by-side and wrap a lot of yarn on (this makes them plush!) 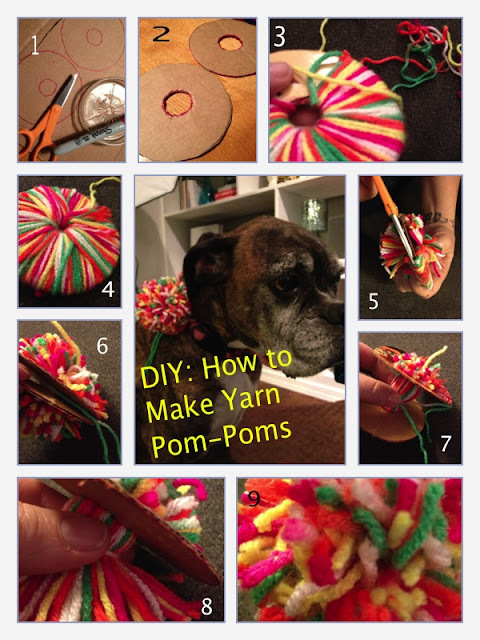 Do not skimp on the yarn now or you will end up with a thin, sad pom. 5. Once you have wrapped and wrapped...weasel your scissor tip in between the two donut forms (this make a nice valley for your scissors to cut through the yarn. Snip a bit at a time. It goes kind of slow. 6. Gently wedge the donut forms apart: just enough to open it to thread a length of yarn inside to wrap around the core of the yarn. Make this yarn long enough that it is easy to maneuver and leaves you length to hang or attach it to something! I tied my pom to our dogs collar (temporarily) thinking she might enjoy a new pretty! But by the look on her face....not so much! To make larger or smaller poms than this medium size...alter the sizes of your donut forms. This is a project that kids love doing too. If they are younger you will have to help them with the cutting but they will be good at the wrapping part.